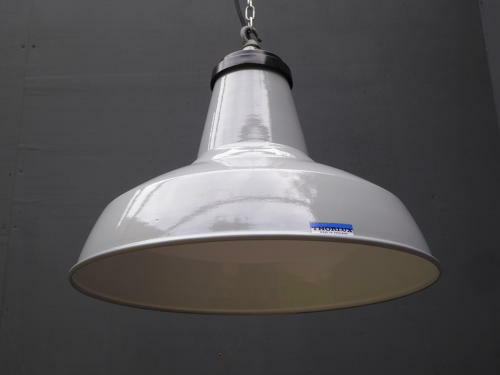 An exceptional run of vintage industrial Thorlux grey enamel pendant lights. A stunning run of grey enamel pendants in exceptional condition with cast metal galleries in original black paint with integrated hanging hooks. Retaining a great gloss to both the interior & exterior enamel & rewired in black silk braided flex. Two now available, priced per light. Wear commensurate with age, excellent overall condition with just the one light having a couple of chips to the rim & interior. Only one or two shades retain their original makers transfers. The lights have been rewired via thier original ceramic bulb holders & accept large screw fit bulbs. They can also be used with smaller screw fit bulbs without modification using a readily available & inexpensive adapter. UK courier service available at £13 per shade, tracked & signed for 24 hour delivery, please do enquire for postage costs for multiple lights (I can ship all eight for around £50). All electrical items should be checked and / or installed by a qualified electrician.